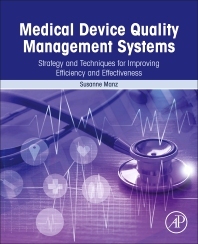 Medical Devices Quality Management Systems: Strategy and Techniques for Improving Efficiency and Effectiveness is written for the needs of quality, compliance, and regulatory professionals in medical device companies. It includes secrets for developing an effective, yet efficient, Quality Management System (QMS) and explains how to create a vision, strategy, and tactical plans. Author Manz shares lessons on leadership, key roles and responsibilities within a medical device company, while also exploring the concepts of process ownership, individual accountability, and how to cultivate a culture of quality and compliance. This book is useful for all executive, functional leaders, and organizations in the highly regulated medical device industry. Identify – Inspection, Audit, Process Control, etc. The author is an accomplished leader in the medical device industry with emphasis on quality, compliance, and Six Sigma and 30 years’ experience in the field. She has worked at industry leading companies such as GE, Johnson and Johnson, and Medtronic. Susanne has an extensive background in quality and compliance for medical devices throughout the product lifecycle from engineering and new product development, to operations, to post-market activities. She is a Presidential Scholar with a BS in Biomedical Engineering and an MBA from the University of NM. She earned her Black Belt and Master Black Belt certifications while at Johnson and Johnson. Susanne also holds Regulatory Affairs Certification (RAC) from RAPS and Certified Quality Auditor (CQA) certification from the American Society for Quality. She has served as a judge for ASQ ITEA awards program. Susanne has now established a consulting business with a mission to provide services to help medical device companies achieve world-class quality and compliance. She has conducted countless webinars, seminars, and training sessions to help companies improve their quality and compliance results.